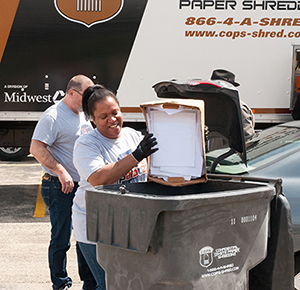 Our 3rd annual Shred-A-Palooza took place on Saturday, April 21st as the kick-off to Money Smart Week in Champaign-Urbana. The event was located at our First Street branch and was open to the entire community. The shred event allowed community members to bring up to five boxes of documents that they no longer needed and we would shred them for free. The purpose of our shred events is to encourage people to shred sensitive documents to help prevent identity theft. As a result of this year’s Shred-A-Palooza event, 25,380 pounds of shredded paper were recycled. That’s enough to save 216 trees! The palooza portion of Shred-A-Palooza featured a free community event for the entire family. We had community partners, inflatables, bubbles, food trucks, and new this year was Touch-A-Truck. Q96 was live on location during the event to keep the community up-to-date with what was happening at Shred-A-Palooza. In addition, we had an open house in our lobby with free coffee, sunglasses, and treats. We would like to express our appreciation to University of Illinois Extension, Division of Intercollegiate Athletics, Chester’s BBQ, Smoked Food Truck, Kona Ice, The Snack Shack, Columbia Street Roastery, Herriott’s, Action Inflatables, Little Bear Hauling, Champaign Fire, Joyful Bubbles, Stevie Jay Broadcasting, Campus Sportswear, Martin Graphics, University of Illinois Police, State of Illinois, C.O.P.S., Illinois Fire Service Institute, and University of Illinois Facilities.